Not surprisingly, it was announced that David Wright may or may not be able to return sometime soon. Translation: it’s time for the Mets to move on, at least for 2015. We can pretend that the indefinite, week-to-week, “I’ll be back sooner rather than later” explanation is legitimate. Or we can accept the reality: an injury that can’t be corrected by surgery because the athlete is “too young” is serious enough to write off that athlete’s season — and tempers expectations for that athlete’s career in general. That’s not to say David Wright won’t return 100% healthy one day — it’s just that, it makes no sense at all to believe that “some day” will happen in 2015. It’s also not saying that David Wright won’t return before the end of this season. But consider this: even if Wright was cleared for baseball activities tomorrow (which he won’t), the severity of his condition combined with his time away from the field means he’s AT MINIMUM six weeks to two months away from being an everyday MLBer. So we’re looking at late July / early August — IF Wright makes a miraculous overnight recovery. The reality is that Wright almost certainly will take another two to three weeks to get back to doing everyday normal people things — and that’s a far cry from “baseball activities.” With a huge amount of luck, Wright MIGHT get back into an MLB game in late September. I wouldn’t count on it. Meantime, Ruben Tejada — the player with the highest OPS in the Mets lineup on Monday night — is the starting third baseman. I’m not sure which of those two facts is more frightening. We know the Tejada story, and we’re pretty sure this is a rerun. After being bound to the bench for a lengthy time, Tejada is given an opportunity, and the combination of Tejada’s short-lived adrenaline boost with opposing pitchers serve up meatballs, the might’ve-been-member-of-Menudo looks like a legitimate answer — for about a week or two. And then, once Tejada has settled in and won a job, the motivation drops, scouting reports remind hurlers they need to treat Tejada as slightly better than a good-hitting pitcher, Tejada starts chasing pitches out of the zone, and yesterday’s answer becomes tomorrow’s question. Even if Tejada could replicate what he did offensively in 2011 and the first half of 2012, it’s not enough bat at the third base position for the long haul. So what are the Mets to do? The knee-jerk response is to pretend that Wright may return at some point in 2015, and therefore find a versatile player who can fill in at 3B for the time being, but turn into a “super sub” upon Wright’s return. Names like Ben Zobrist and Martin Prado immediately come to mind. But guess what? Neither of those players, or players of that ilk, can be had in return for a package of Eric Campbell and Darin Gorski — no matter how badly Mets fans would like to believe such a deal is possible. And no, you can’t sweeten the pot with Matthew Bowman and/or Tyler Pill. The conversation will start with Steven Matz and work down from there (and not far). So stop dreaming — acquiring a legit player from the outside ain’t happenin’. But there IS an absolutely perfect fit for the “fill in at 3B now, become super sub later” role — and it won’t cost the Mets anyone in a trade. The fit is Daniel Murphy. Murphy moves to third, Wilmer Flores shifts to second, and Tejada slots in at shortstop while he’s hot — and when he cools down, the fans clamoring for the shiny new Matt Reynolds will get their wish (shiny happy people, how is Kevin Plawecki doing? getting dull for you yet?). For those who have not rushed to the comments and reading on, let’s consider reality. Despite the fact it makes most sense to play Murphy at third, Tejada at short, and Flores at second (or switch Flores and Murphy), what most likely will happen is Murphy will move to 3B and Tejada to second. Or at least, it should, because at least then the up-the-middle defense is improved, even if Murphy’s botches and brain freezes lower performance at the hot corner. Less baseballs are hit toward third base, so problems there are slightly more tolerated. Ideally, Tejada stays hot just long enough to segue into the return of Dilson Herrera. Then Herrera can take over 2B and Tejada can platoon with Murphy at 3B — even if it’s as a late-inning defensive replacement. And oh by the way, the Mets have another option for 3B by the name of Michael Cuddyer. I’m not sure how much of an upgrade he’d be over Murphy defensively (if any), but he’s been in that position 174 times in his big-league career. There’s one more thing to consider: the Mets are at the top of the NL East right now without David Wright. Despite all the talk of losing Wright and Travis d’Arnaud, the division is such a crap-show that the Mets are still neck-and-neck with the Nationals, with the Braves much further behind than the standings suggest. And they did that with Wright appearing in only 8 of their 53 games. In fact, the Mets didn’t reach first place until AFTER Wright went on the disabled list. So perhaps all this talk of how to replace Wright is for naught. And that’s really the bottom line, isn’t it? Without Wright, and regardless of where the Mets place the defensively dysfunctional Murphy and Flores, they’re still in the fight for first. What else matters in the goal of ticket sales and “meaningful games in September”? Don’t expect an acquisition or a big trade in light of David Wright’s terrible news. As long as the Mets stay close enough — and they will, considering the ineptitude of the teams below them — they’ll keep the interest of the sheep and sell tickets. Oh, make a profit, as every business should. Between not adding salary to replace Wright, cashing in on the insurance policy they have on Wright’s contract, and remaining interesting enough to generate revenues through September, the Mets may make their first profit since moving into The Field At Shea Bridge. Which will then be used to sign a big-name free-agent in the winter, right? Ah, that’s for another day. For now, let me know what you think the Mets will do — if anything — in reaction to the news that David Wright will be out indefinitely. I think I agree with everything you said. Wright isn’t coming back any time soon. The ideal setup would be Murphy, Tejada, and Flores from left to right side. But factoring in Herrera, as you said, they will probably go with Murphy, Flores, and Tejada. Only thing I disagree with is the tone of contempt for the front office through out the piece. LOL, I just don’t completely share it. I love david and hoped just as much as anybody he could return, but sadly his career is over. Might he come back and play baseball? Sure, but he ain’t getting any younger, and this injury will affect him for the rest of his career/life. There’s no way he will be able to play at a high enough level to justify his contract. As sad as it is, and as much as you don’t want to root for anyone to get injured, the best thing for the team is for him to retire rather than drag out the rest of his career here. Am I getting way ahead of myself? Possibly. But if I’m the front office thats how I’m viewing the situation. 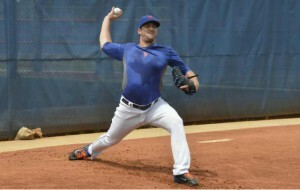 Time to look for a long term replacement at the trade deadline (colon/murph for a soon to be ready infield prospect??) or in the offseason. I’m a flores fan and would still like to see him play out his time at SS, rather than jerk him around the infield. If you decide to switch his position, save that for the offseason when you have a real concrete infield to build around. I don’t see any better options coming or worth pursuing right now anyway, and juggling this infield won’t make much of a difference. He might not pass Joe’s eye test, but I wonder how many current MLB SS would. New York would be all mine! If I only had a spine! It is a amazing how a guy who work ls with wine is 100% positive he knows everything about everyone’s medical condition. The world is surely punished because one spends his valuable time saving wine vice people. Just think if Janish had studied medicine officially cancer would surely have been cured by now, and good wine makers would still make good wine. Agreed — it is TRULY AMAZIN’ !!!! As for curing cancer, it never would’ve happened — big pharma would’ve dumped me in a river before I could discover the cure. BTW, what the heck does this mean: “The world is surely punished because one spends his valuable time saving wine vice people.” ? Wright is done for 2015 (Janish)? Wright’s career is over (Jon C)? Aren’t these statements a bit over the top? I’m not a medical doctor, and I don’t believe anyone commenting on this blog is either. So how do we know Wright’s done for the year or worse, his career? I agree that it doesn’t appear like Wright is returning soon. But the baseball season is long and isn’t it possible that he misses something like two months and comes back on August 4? So Janish and I finally agree on one thing. On another note, I’m not that familiar with Cuddyer’s career but didn’t he play most of those 3B games early in his career? I just wonder if he can still play 3B now that he’s 36 years old and hasn’t done so in (I’m guessing) a number of years. I’m thinking the ideal Mets infield alignment is Herrera at 2B, Flores / Tejada at SS, and Murphy at 3B. I’m not confident Tejada is the player he’s proven to be the last couple weeks, but I would be delighted if he is. Flores – my favorite player for how much craps he takes and how much he got jerked around by the Mets (i.e., if they thought he could play SS they should have kept him at SS the last two years in the minors instead of playing him at 2B and 3B and forcing him to learn SS in the pressure cooker that is New York) – has to get that OBP up from its current level of .280 to something like .330 or he’s not long for starting at any position. I believe in his bat but he’s got to start getting on base more frequently. This is great…and now today the murph/tejada swap. definately the right move. and i believe you got to stick with flores at ss, because of herras potential. i think the bat that is needed is in the outfield, cuddy and grandy cant cut it…mets need another bat in the of. ryan braun. I doubt the Mets are leaving Wilmer at SS to boost his trade value. I think “let’s not move him” is simply an acknowledgment that the team can’t stick with plans, and so if Wilmer gets shifted this week, he’ll probably be shifted again next week, and learning a new position every week could mess anybody up. Just look at Dillon Gee. That’s reliever / possible starter / 5th starter / minor leaguer / 6th starter / reliever Dillon Gee, who somehow didn’t thrive in his one turn as #6. Whoever is making the “Wilmer at SS” call knows that if he wavers, then after that, between Sandy and Terry and Teufel and the Wilpons, it’ll be a chaotic open season on who plays where. Who did make the final call on Gee, by the way? Did Terry over-rule Sandy? As for Wilmer’s bat, I maintain that he’ll be very good in his prime, but his prime is still 3 years away. Right now, he has no place on an MLB team with playoff hopes unless that team is otherwise loaded and can afford to carry him just for the sake of his development. Is anyone carrying J.P. Arencibia just because he can bash 25 HRs while occupying a skill position? Nope. It’s been nice watching Tejada play well, but Gary and Ron are sticking to the old narrative of “he’s good when he stays level and doesn’t hit the ball in the air” despite the fact that Ruben is, in fact, swinging slightly up and getting his extra-base hits on deep flies. It’s not a new approach; he’s simply hot. When he cools down, and more of those fly balls are lazy, you’ll hear how he’s back to his bad habits, but that’s not the problem. The problem is starting too early and offering at too many borderline pitches (and, yeah, occasionally over-swinging). Right now he’s waiting nicely and showing a good eye (seems those two often go together). As for David Wright, I don’t know what he’ll do. He’s tough and gritty enough to try to jump back into activities that might put him in a wheelchair, but is he really baseball-obsessed enough to do that to his wife and future children? You can bet Molly is begging him not to take the field until the doctors are SURE his next dive in the hole (or violent twist to turn on an inside fastball) won’t push him towards ending up crippled. And when will they be SURE? Probably not this year. Probably not ever. We’ll see what David decides. Any of y’all who send your prayers out to athletes, send some his way.